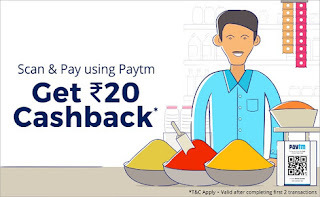 Paytm – Get Rs 20 Cashback on First 2 “Scan & Pay” Transaction. If you haven’t transact on using Paytm “Scan & Pay” Feature yet, Then here is best offer for You where you will get the Flat Rs 20 Cashback on your First two transaction of Rs 20 or more. Offer is valid only for Grocery/Retail Stores, Restaurants, Petrol Pumps, Dairy outlets, Pharmacies, Parking, Auto/taxi Rides, Hospitals, Automobile Services, Beauty & Fitness etc. Offer is valid from 26th October to 08th November 2017. So Hurry up !! 4) Scan the QR Code to Pay money. (You have to made 2 transaction of Rs 20-20). 6. Cashback will be credited within 48 hours of successful payments. 9. In cases of fraudulent/suspicious transactions, Paytm solely reserves the right to revoke the Cashback offer.